New Orleans Artists and Musicians Relief Fund! 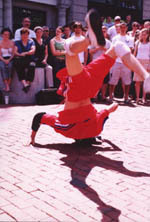 During the summer of 2003-2004 the Street Arts and Buskers Advocates documented street artists in Cambridge, Boston and MBTA Subway Platforms. Transformers -- Break Dance team from NYC. 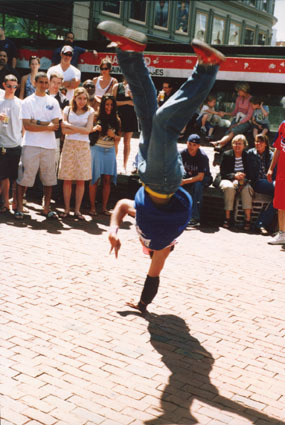 Spins, flips, mock competions, comedy acrobatics... 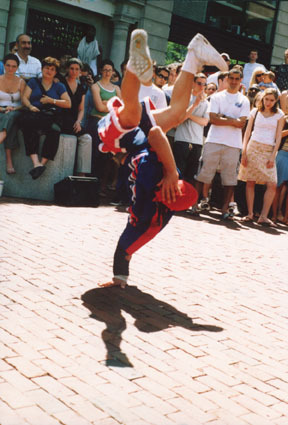 Perform in Harvard Square, Cambridge several times a year. 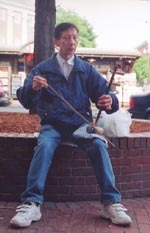 Pictures by Stephen Baird June 2004. Clara Schuhmacher (Brown University), Pablo Schuhmacher (Nobles and Geenough School), Lauren Ingram (University of Massachusetts Amherst) and Haruka Horiuchi (Massachusett Institute of Technology) have participated in the project. Lauren Ingram has written an undergraduate thesis with black and white photographic documentation on subway performers. Excerpts will be published here in the future. 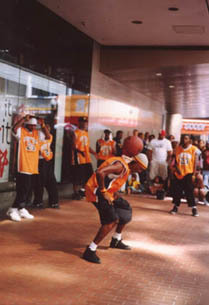 Street poet extrodinaire -- performs solo, with musicians and/or troup of readers. 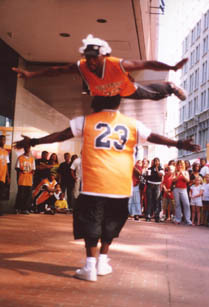 Has performed and read internationally. I started playing guitar while a student at Boston University.I have been playing in the subways of Boston and at peace/social justice demonstrations. I'm into doing classic rock covers and originals-have 4 CDs. My CDs are---"THE REVOLUTION IS COMING," "1967," "SMASH THE STATE! !," "CLASSIC ROCK UNPLUGGED." 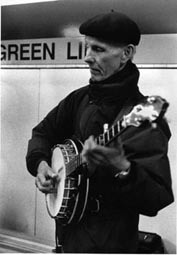 I also write protest songs against the U.S. war machine, against the U.S. wars on Iraq and Afghanistan, and against capitalist globalization. I'm like a late 60s-early 70s rocker. My favorite bands are the Moody Blues, the Byrds, Jefferson Airplane. 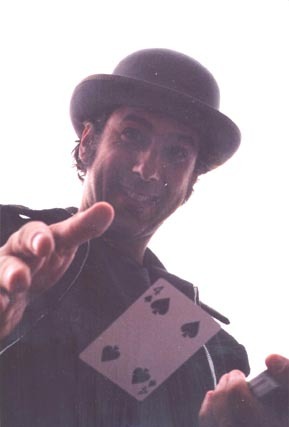 I play acoustic guitar, 12-string electric guitar, and a little keyboards. 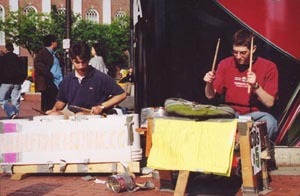 My favorite gig was playing my song "Whose Streets? 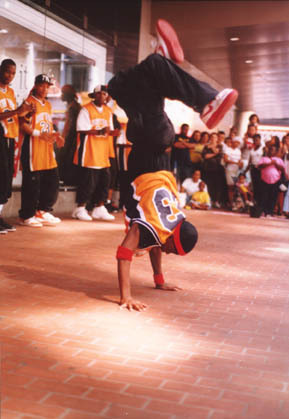 Our Streets !!" 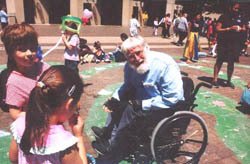 at a demonstration against the United Nations Millenium Summit in front of the UN plaza in New York City--this was in September 2000. 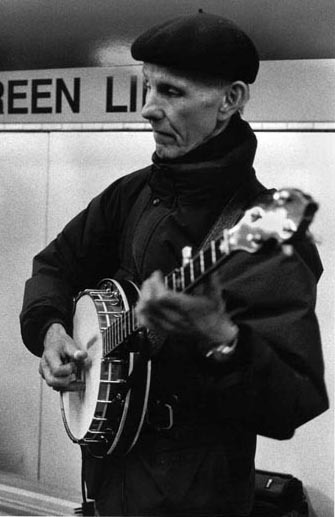 I also performed some George Harrison and John Lennon songs at a vigil for them on Boston Common Dec. 8, 2001. 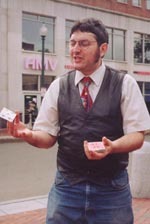 In Feb. 2002 I performed at a concert in Cambridge, MA called Take Back the Music doing some of the songs banned from radio play since 9/11. 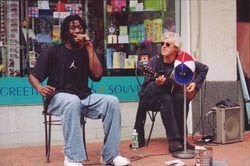 In June of 2002 I played a song I wrote called We Got To Be Free at a rally for the ACLU of Mass. 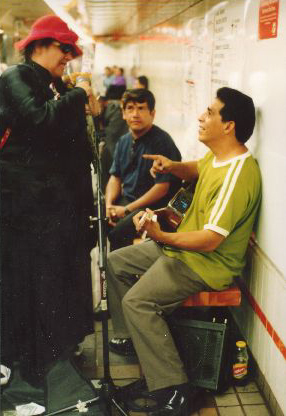 to save our civil liberties.In the fall of 2002 and continuing through 2003 I have been singing in the subways of Boston--- a lot of anti-war songs against US war on the Iraqi people. 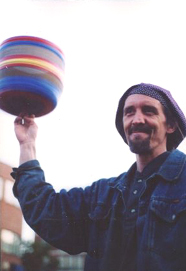 Brother Blue (Dr. Hugh Morgan Hill) tells original stories, Shakespeare, and stories from many cultures. 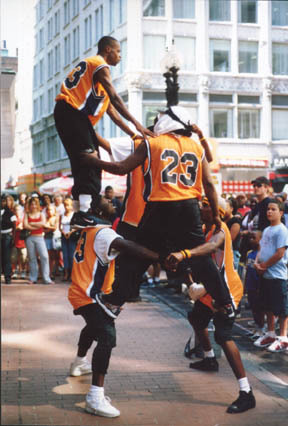 He has performed for Harvard University, Omega Institute, National Storytelling Festival, National Association of Black Storytellers, First Night Boston, Cambridge River Festival, New Age Congress in Florence, Oral History Association. 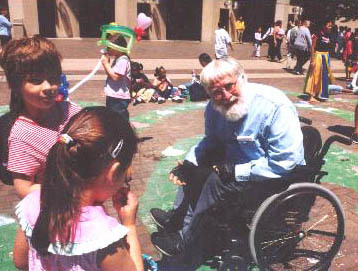 He was official storyteller for United Nations Habitat Forum, and is official storyteller of Cambridge and Boston. The National Storytelling Network presented him with a Lifetime Achievement Award. Mark Farneth, affectionately known by Harvard Square regulars as ëthe rope walker', has a gift. And it's not being able walk nightly across the rope he ties between (street name) and (street name), although that is no small feat. 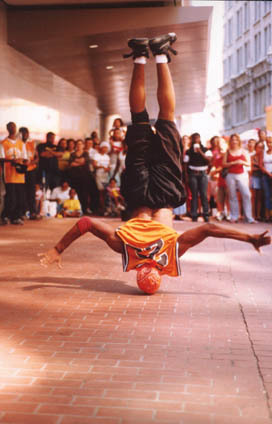 He is a true street performer, able to captivate audiences for hours at a time - and the way in which he creates such an audience is often as entertaining as the show itself, a combination of juggling, magic tricks, and the famous rope walking. 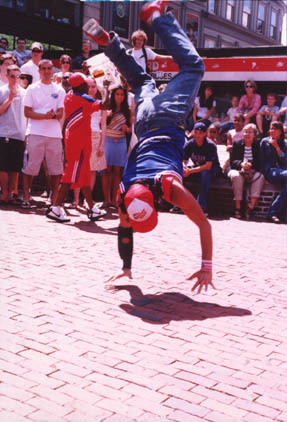 Asking those passing by to take one step closer to someone they don't know, assuring that it will not hurt them, no matter what they were taught when they were young, Mark involves his whole audience in his act. He singles members out and pokes good natured fun at them, therefore creating an easy going ambience that contributes to the success of his performances. "I'm glad I wore my cleavage-less shirt today," Gina jokes as she bends over a blank piece of paper, green spray can in hand, thinking of her next design. A little boy standing off to the side of Gina's layout points excitedly to the bottles of paint. "You mean she draws with spray paint?" he asks his mom, incredulously. "That's so cool!" He's not the only one who thinks so - Gina's work with spray paint graphics is definitely ëcool', judging from the sizeable group gathered around her tarp, admiring the skillful way in which she manipulates the fine mist that is spray paint into beautiful scenes depicting everything from space to the jungle. 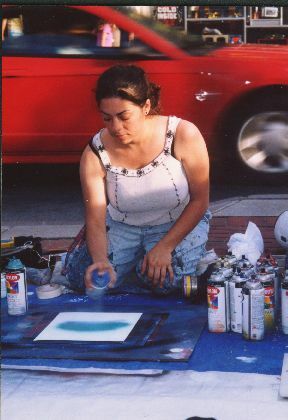 It's no wonder, as Gina's been working with the medium for more than eleven years, having started in 1992 while in Key West. 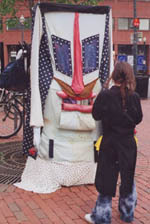 She heard of Harvard Square during one of her travels, and subsequently landed here in 1996, where she has been painting ever since. 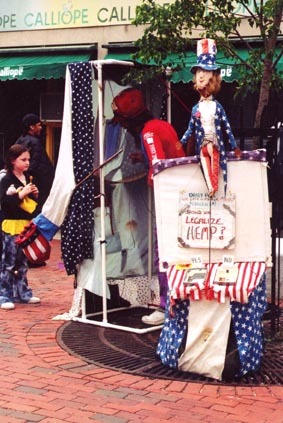 But what really makes her cool is the reason why she's set up her paints across from the candy store every day for seven years:"It's about the people," she says without hesitation,"I meet so many interesting people." Show is set to music and consists of comedy sketches of various characters such as a Ballerina and Cowboy. 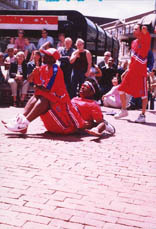 Audience participation is a key component, especially in the dance sequence! 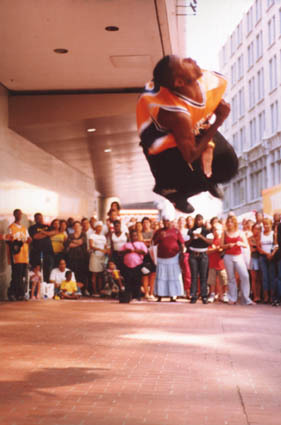 The danger section focuses on the "big tricks" &endash; the famous wheelbarrow balance on the rolo-bolo atop a five foot high table. Boston folksinger Mary Lou Lord has been in and out of the spotlight throughout the last decade. 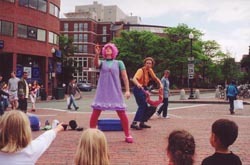 Coming off a publicity hiatus due to the birth of her daughter, Mary Lou got back to performance basics, spending the time busking in the street after her1998 major label release "Got No Shadow". She has recently provided the music for a Target commercial. 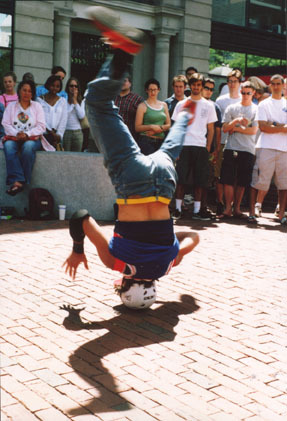 That song, "Speeding Motorcycle," a Daniel Johnston cover. She tackles songs by legends like Bob Dylan, Richard Thompson and Bruce Springsteen as well as newer "indie" oriented artists such as Elliott Smith and the Magnetic Fields. Mary Lou will be recording her next studio album for Rubric later this year. "I wanted to know if I could do it," Richard admits, when asked what first motivated him to set up a chair in Harvard Square two summers ago, and twist balloons and perform magic tricks for the children (and adults!) who pass by. 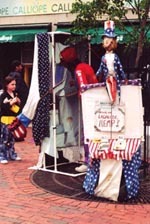 After two summers &endash; both of which have been spent on the same corner in the Square performing magic weekends and twisting balloons weekdays &endash; and one winter &endash; spent exploring the busking scene in Argentina and Brazil - ëwanting to know if he can do it' is no longer his motivation. 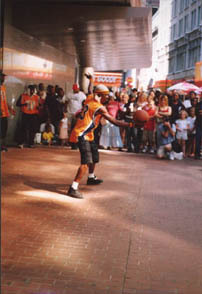 Street performing, explains Richard, has changed his life. "I could never go back &endash; I absolutely love it." Rhythm and Blues to Soul to Motown -- Gerry Mack will sing and make his key board rock the night a way. 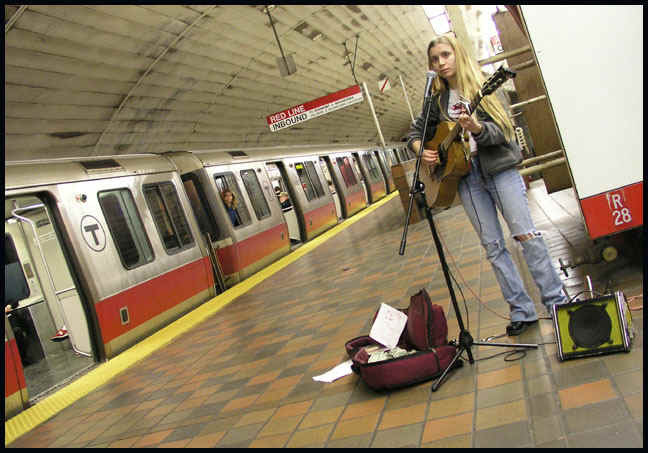 As a full time touring singer/songwriter, Boston area native Danielle Miraglia has captured eclectic audiences all over the map from music lovers in listening rooms to rowdy late night bar crowds. Edgy, humorous original tunes like "Hot Mom" and "Dysfunctional Home" and heart wrenching songs like "Moment by Moment" delivered with a captivating stage presence have landed her opening spots for the likes of Patty Larkin and Brooks Williams, a national television appearance, a Sunday night residency at The Burren in Somerville, MA and a growing buzz on the music scene. Late afternoons you'll find Peter, a classical guitarist, performing for large audiences out in front of the Au Bon Pan, where he's been playing for over five years. 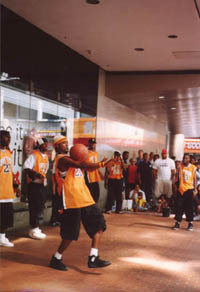 Street performing is only one of the soft-spoken musician's talents, however. 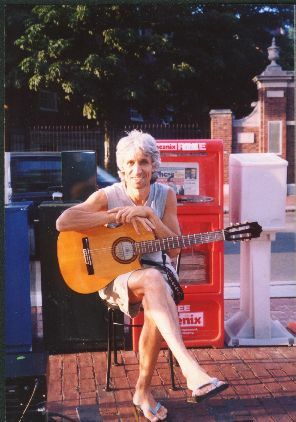 Indeed, a graduate of Berkley College of Music, this Russian guitarist has accomplished much in his twenty-five years with the medium: he plays regularly at variety of venues in and around Boston, and has also recorded a number of cds. 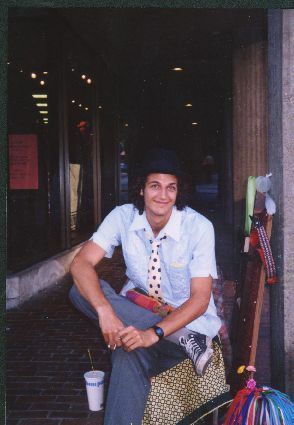 Although he is primarily a classical musician, Peter has explored other genres of music as well, especially jazz and basso nova. 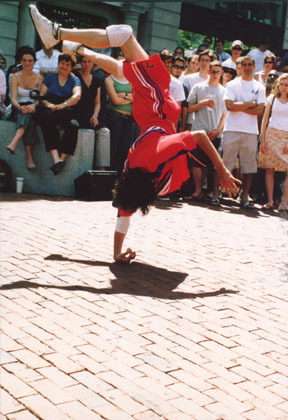 When out in the Square, Peter says he likes to improvise on well-known pieces, which allows him to be original while still communicating to his large and varied audience. 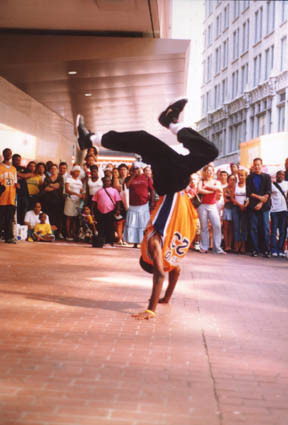 TSidewalk Sam draws pictures on sidewalks in the midst of pedestrian traffic and delights passerbys with his friendly, inclusive creative spirit. street puppetteer/ busker/political pusher son of always working mother/preacher teacher father/got 4 brothers (third of five ) two daughters (S&A )/1 grand daughter/a beautiful talented family of scammers ,especially that grand with the little scam smile that melts all resolve and the most beautiful companioness in the world today. 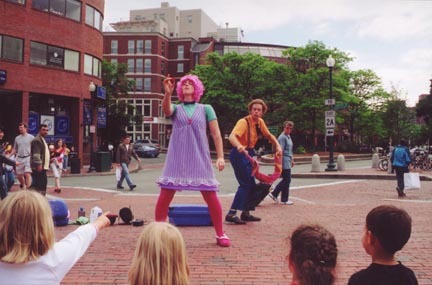 Note: The Uncle Scam web page has a photo gallery from 1999 on of Brattle Square perfomers and artists. Also has a links page to many artists. John, however, does not believe in childrens's music, which he equats with playing down to children. He says that if kids like his music, they like it, and don't need to be played down to. In general, they respond very well to his music. John said that sometimes he'll "finish playing and no one is clapping, and all of a sudden he'll here one kid going 'Yay,' completely uninhibited."